Is comedy right for my venue? As you see we have a new exciting website. If you are already a member and cannot login, please click forgot password link. Enter the world of comedy. Win free tickets, hire and book comedians plus read all the gossip here first! FREE Membership not only entitles you to ticket discounts and offers, it will reward you with more localized information about our clubs, special events, TV shows, Competitions and more. . . oh it's clever! Join our newsletter and get special offers, discounted ticket prices and comedy show news delivered straight to your inbox. 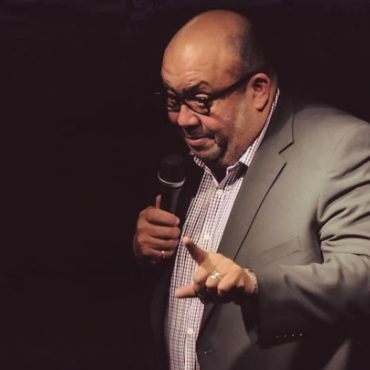 North Londoner Simon Clayton's subject matter is simple - it involves being fat, mixed race, married, balding because that is what he is, and anything else that currently makes him laugh. Although not necessarily in that order. Simon's former head of sixth form at Southgate School, Mr Massey wrote of him: ''Simon's natural brightness often leads to disruptive high jinks during registration''. The Comedy Club Limited do not act as a forwarding address for any of the artistes listed within this website. Due to the Data Protection Act, under no circumstances do we issue any artistes contact details or accept requests for autographs or deal with journalistc enquiries unless the artistes in question have been secured through The Comedy Club for your event. Whether you're looking to host a Comedy Club show at your venue, hire a corporate comedian, host a corporate comedy show or use the uplifting gift of comedy in any other way, we are here to ensure your event has that unbeatable Comedy Club edge. Book a Comedy Club show and you will not only receive our industry leading service, your customers will enjoy the UK's top comedians performing at your venue. The Comedy Club (Official) © 2019 | web design by webwax ltd.